Are you aware of the Colorado Craft Cider movement going on in Colorado? You should really check it out because these dry craft ciders are better than you can imagine. If you already live in Colorado and you are not drinking the local hard cider, you are missing out big time. Recently, I had the good fortune of being a guest at a luncheon held at Thirsty Lion’s Union Station in Denver, Colorado. The Colorado Department of Agriculture in association with the Colorado Wine Industry Development Board hosted this craft cider event. Chris Wiseman, Deputy Commissioner and our hosts Doug Caskey and Kyle Schlachter were in attendance at the luncheon representing the state of Colorado up close and personal. It’s always good to see your tax dollars at work. Coming from Oregon, I was beaming with pride as I walked through the doors of Denver’s Union Station Thirsty Lion Gastropub and Grill. John Plew and Russ Teising of Concept Entertainment are a couple of Oregonians, and they have a real winner on their hands with this gastropub concept. In addition to a few other successful restaurant concepts, Thirsty Lion’s six gastropub locations prove they have the skills to pay the bills. The food is outstanding and the beverage program is progressive. It was no surprise to me the Colorado Craft Cider event was held here. Aaron Foge of Branch Out Cider poured our first glass, a dry, bottle aged cider called 2013 Perennial. It paired well with our first course, a tasty rendition of the classic Devils on Horseback (bacon wrapped dates stuffed with gorgonzola and almonds). Perennial spreads across the palate with broad apple flavors that are clean, crisp and dry with lemon zest and honeycomb adding a touch of spicy apple tingle lingering on the tongue. Branch Out Cider is a super cool community concept located in Ft. Collins, Colorado. Ft. Collins community members grow and donate all the apples used in the making of Branch Out ciders. When they register their tree or trees with Branch Out, they receive a portion of the finished product for their donation and receive special member pricing for any of the cider they purchase as an incentive for donating the apples. 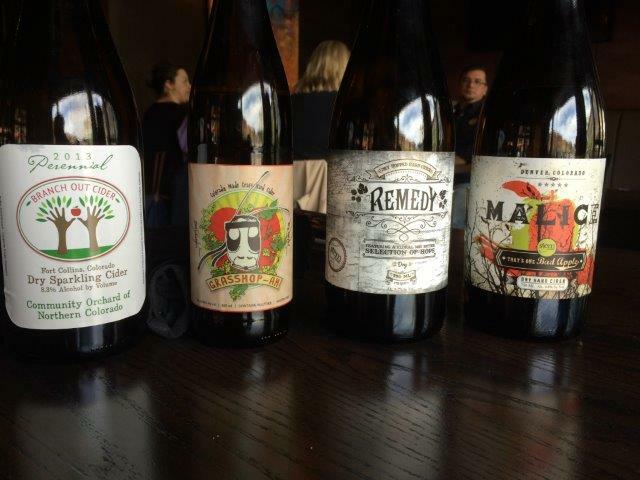 During our next course, we had the pleasure of tasting some cider from Stem Ciders called Malice. Dressed with pomegranate and balsamic vinaigrette, a complex salad of shaved brussel sprouts, grilled chicken, and quinoa melded together with the dry, tart flavors of the malice cider creating a symphony of desirable flavors.Colorado Cider Company’s Grasshop-ah was, for me, the most unusual combination of tastes in the tasting. Made by Brad Page, this dry cider undergoes an addition of light hops and lemongrass during the fermentation process enhancing the citrus zest and apple components. BBQ shrimp wrapped in bacon was served accompanied with a Napa cabbage slaw bringing cooling senses and tasty textures, joining the cider to the dish in a harmonious manner. Stem Ciders poured Remedy, a dry hopped cider with our final course, asparagus and mushroom risotto served with a tasty filet of grilled salmon. It was another masterpiece of a dish created by Thirsty Lion’s Chef Ricardo Castillo. Remedy is a Cascade and Citra-hopped cider whose bright apple and floral aromas pleasantly perked my aroma receptors while cleansing the palate between each bite of the perfectly prepared salmon and risotto dish. All of the cider consumed during this luncheon represents a new direction for the cider industry. This Colorado craft cider is worlds apart from any of the mass produced commercial hard ciders available in the market today. The Colorado Craft Cider luncheon menu should be available to the public at the Denver Thirsty Lion Gastro Pub. Why stop there, it should go on the road to all Thirsty Lion locations. If you get to try some of the Colorado Craft cider, I’m sure you will agree. Remember to always, “Eat well, Drink well and Live well! Enjoy!